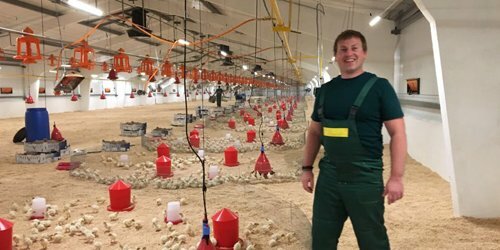 The Russian turkey industry is rapidly evolving and we are pleased to highlight recent activities in this region. September 27-29, 2016 Hybrid Turkeys and Cargill partnered to hold one of the first turkey specific seminars in Russia. The seminar focused on the global turkey market, feeding and management recommendations as well as veterinary issues. Almost all of the largest Russian market producers were present and appreciated the opportunity for learning and connecting with experts from around the world. A new parent stock placement took place in September of this year. With any new customers you have new processes to work through in areas like transportation and customs for example. To ensure a successful placement we had a Hybrid representative available every step of the way to provide support and expertise. In addition to following the delivery, we worked with the customer to ensure the barn provided the appropriate environment for the birds to thrive. This involved evaluating factors such as temperature and humidity levels, gas levels, and appropriate number of feeders and drinkers. Overall, the results of this placement were positive, and we plan to continue working together in order to ensure long term success. Whether a new customer or one who has been raising Hybrid Turkeys for a long time, our goal is to ensure your success. For tips and insights into raising your birds visit www.resources.hybridturkeys.com or contact us.